Do You Believe You Have the Capacity for Evil? What if it is true that every living creature has the capacity for evil, even if we choose to not acknowledge it? And what is the cost to us if we choose to not acknowledge this truth? Very often the cost of this is we become targets for manipulation and abuse. We become this target because we refuse to use our capacity that was given to us, our capacity for evil, because we translate that to mean harm, rather than protection. It is true that some operate from their capacity for evil, but it is not true that some do not have the capacity for evil, and denying it is often at the root of our circumstances. Every living thing, was given some means of defense, some means of protecting themselves…the question becomes what prompts us to use those mechanisms, and how much will we tolerate before we do? For those of us that had a history of choosing sociopathic relationships, we literally confused protection and harm. We would never harm another, and we refused to accept that we even had the capacity, and in doing so we had become very proficient at tolerating the intolerable. We chose to take the abuse…deciding it was acceptable, as we never wanted to be perceived as mean. We wanted to offer compassion, comfort and love. And we gave these things beautifully, only while we are “asleep,” (which is the term I use to explain that state of being where we are unaware of our full capacities and the truth of our lives), we neglect to give those same gifts to ourselves. We forget that we matter in the formula of love and life. Just like every rose has its thorns, we too have the power to protect our beautiful, delicate spirit. In fact it is, and always has been, up to us to decide when to use that power to protect. To do so, we must wake up to the parts of us that we have chosen to deny…our capacity for evil. 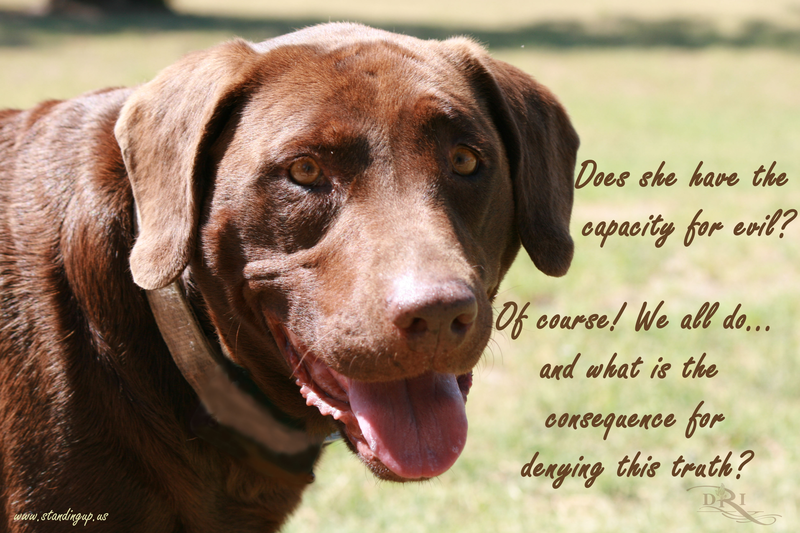 It is just a capacity, and denying it in ourselves…makes it too easy for us to deny in others. We so want to believe that people are inherently good…and wouldn’t harm. This is simply not always the case. All beings have the capacity for evil, it is just what might prompt it that varies. Just like my dog would never harm, I would never harm. But if someone was to beat my dog, she just might then ignite, perhaps even without thinking, her capacity for evil, because for her it is instinct. We may have turned that necessary instinct off and it can be quite detrimental. Now if my kind dog was moved to attack, there would generally be warnings first, and then, if there was no way out…she would likely attack. I would never hurt my dog because of who I am, but inherently I know that she could harm me and vice-versa…all creatures can harm, I just know it is not her nature to do so…she acknowledges the same in me. The cost for not acknowledging such a capacity could be high. This is not only true for dogs, it is true for people. It should not be only in a life or death situation that you become aware and acknowledge the power that is within in you. Don’t wait for a life or death situation to ignite your awareness of your capacity to protect. Instead, you want to understand and embrace all your capacities, at all times, so that you are safer in the world. What you acknowledge about yourself has a great deal to do with what you attract to you! If you are looked upon as someone that does not know or acknowledge they have the capacity for harm, can you see why you can be a target? And can you see if people recognize you have the capacity, that knowledge alone increases dramatically the likelihood that you will never need to use it? If others believe you would not harm, even to protect, those that operate from their evil capacity will looked to leverage that to their advantage. You may wonder why we are so quick to excuse the cruelty, evil-doings or even simply the meanness of others. This is because we ourselves are unwilling to see our own capacity for evil. We do not even like the word. We shudder to think we could possibly have such a capacity and, as a result, we deny it in ourselves and we deny it in others, even as this truth is displayed boldly before us. We have disowned our capacity for evil long ago, perhaps with no conscious awareness. We close our eyes to it. We deny this capacity that is inherent in every human. Yes, every human has the capacity for evil, even us, and even those we love. I was instructed to go home right in that moment, and tell my daughter that I had told her what I believed was the truth, but that now I learned something different, and needed to tell her what was the more accurate truth. To help me see this conclusion my therapist asked me if I would do to another the things that were being done to me. My answer was an adamant “no”…but of course my immediate thought was so clear, no one understood his pain like I did, if they did, they would know he was doing the best he could. I couldn’t see the great assessment tool I was given in that moment, to ask, “What would keep me from doing those acts on another?” I couldn’t see that it was because they were mean, cruel, yes, even evil acts. They were too mean for me to do to another, yet not too mean for me to accept from another. I couldn’t see my pain through my illusion of their pain. He was a bad man. I had never even opened my mind or heart to that consideration that some people are inherently bad and I wouldn’t for quite some time. He was a bad man who did some good things and he wasn’t healthy for us to live with anymore. The fact that we have the capacity for evil or harm does not make us evil. If you prefer, think of it as your dark side, or your shadow; the part of you where the light is hidden from. You would not do evil. It is your sense of ethics that keeps you from acting in evil ways, however, that does not nullify the reality that you have the capacity. You cannot awaken until you embrace this truth. All humans have the capacity. To start, consider this; have you ever had an evil thought? Something that you considered but you would never do? Perhaps you have even acted on it. Perhaps you have lied, or manipulated, or stolen. These are all acts of the shadow, but these mere acts do not make you an evil person. Once you embrace this capacity it may very well give you a lifeline. There are lifelines available for you that would seem unreasonable to grab while you are asleep. In fact, while asleep, you are not even able to see the lifeline. Part of awakening is accepting this side of you, the shadow side. You cannot arrive at your freedom without it. You may be saying to yourself…but I stand up for myself all the time. I tell people I do not deserve to be treated this way! You see, but if you are doing that repeatedly, perhaps you still have not seen the problem? Once it is clear that you will be honored by anyone in your life, there will no longer be any reason to defend. Once you acknowledge that you truly have the capacity ; Once you are certain that you can and will protect yourself, that presence alone sends out a new vibration that only invites in all that is good…and if anything in contrast shows up, you know you can release it and never look back, because now you have factored yourself in the formula. You too deserve compassion and love and have the power to assure you receive nothing in opposition. You just must acknowledge that you figurately have thorns, or a sword, a given defense to help you stand. The power has always been within you. We simply need to reignite it. ​Partner with people to relinquish their chaos and confusion in exchange for clarity and resolution from whatever crisis they find themselves in. I do not give legal advice, nor do I use legal principles to apply to your circumstances. Instead I focus on how to empower you to communicate and use proper positioning to win through influential and concise communications. I guide people to Wake Up, Stand Up, Live Free. « Are You Ready to Stand Guard Over What Matters Most?